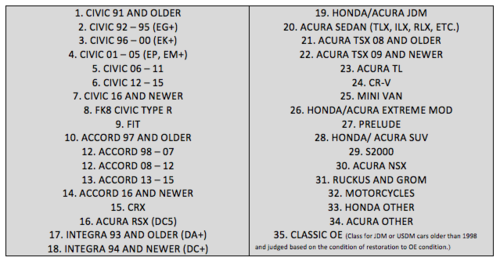 ALL RACE CARS MUST HAVE A HONDA OR ACURA ENGINE. RACERS CAN ONLY RACE IN 1 CLASS. ALL SFWD AND ALL MOTOR RACERS MUST BRING YOUR OWN SEALED CANS OF APPROVED FUEL. REFER TO CLASS RULES FOR MORE FUEL INFO. *RACERS TOWING THEIR RACE CARS ARE HIGHLY SUGGESTED TO PARK BETWEEN 4PM-10PM(SHARP) ON FRIDAY (4/5) OR SATURDAY MORNING STARTING AT 10AM. RACERS WHO PARK ON FRIDAY MUST PURCHASE ALL TICKETS WHEN THEY ENTER. COMPETITORS IN THE ALL MOTOR AND SFWD CLASS ARE ALLOWED 1 RV PER TEAM (EVEN IF THE TEAM HAS MULTIPLE RACE CARS) AT NO ADDITIONAL COST. IF YOU PLAN TO BRING AN RV YOU MUST REGISTER THE RV BY 3/31/19 BY EMAILING BRIAN@OGS1320.COM AND YOU WILL RECEIVE AN EMAIL CONFIRMATION IF YOU ARE APPROVED (*YOU MUST HAVE COMPETED IN THE ALL MOTOR OR SFWD CLASS AT A PREVIOUS OGS1320 EVENT). ALL RV’S THAT ARE NOT PRE-REGISTERED WILL BE SUBJECT TO A $150 RV PARKING FEE BY MARYLAND INTERNATIONAL RACEWAY. ALL ATTENDEES (SPECTATORS, RACERS, CAR SHOW COMPETITORS) ABOVE THE AGE OF 18 WITH A VALID DRIVERS LICENSE ARE ELIGIBLE TO ENTER TO WIN THE CAR. YOUR TICKET WILL HAVE A UNIQUE NUMBER. YOU WILL NEED TO BRING YOUR TICKET TO OUR GIVEAWAY TENT AND ENTER YOUR INFORMATION ONTO ONE OF OUR IPADS. YOU CAN ALSO SIGN UP ONCE YOU HAVE YOUR TICKET ON THE HDAY APP (AVAILABLE FOR IPHONES AND ANDROIDS). YOU CAN ENTER THE RAFFLE ON SATURDAY AND SUNDAY AND YOU HAVE TO BE PRESENT ON SUNDAY TO WIN. THROUGHOUT THE DAY ON SUNDAY OUR HOSTS ON THE MAIN STAGE WILL RANDOMLY SELECT A TOTAL OF 10 ENTRIES. TOWARDS THE END OF THE EVENT ON APRIL 8 EACH OF THE 10 SELECTED WILL BE GIVEN A KEY AND A CHANCE TO START THE CAR. ONLY ONE OF THE 10 KEYS WILL START THE CAR.